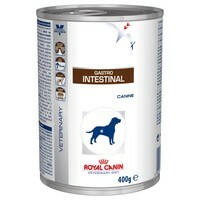 Royal Canin Gastro Intestinal Tins for Dogs is a complete and balanced veterinary diet to promote nutritional restoration and convalescence for dogs with acute and chronic digestive disorders. My dachshund has a rare condition called Megaoesophagus and this food is vital in terms of keeping him alive. It is rolled into "meatballs" and he loves it! I believe it has helped him become a healthy weight again and my other dog wants it too!